You ever see Kagemusha? It's that terrific 1980 samurai flick Akira Kurosawa made. The movie centers around Shingen Takeda, an iconic feudal lord in Japanese history, and according to fashion model Anri Takeda, a relative. 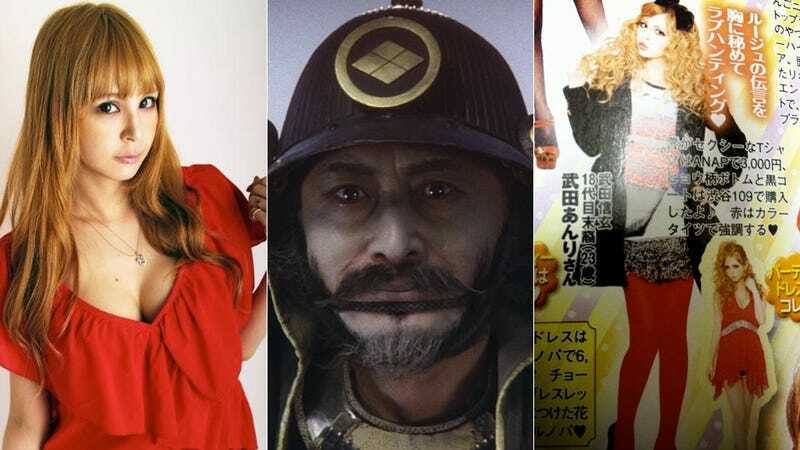 Takeda recently appeared in Koakuma Ageha, a magazine that focuses on nightclub hostess fashion and that has lent some of its fashion models to Sega's Yakuza games. In the magazine, Anri Takeda (武田アンリ) claimed that she was the 18th descendant of Shingen Takeda (武田信玄). This was her claim to fame. And now, infamy. A photo of Anri dolled up in outrageous fashion with the blurb of her heritage soon went viral in Japan on February 21, getting retweeted over 18,000 times, with people left speechless. The DNA of Shingen Takeda lived on in a hostess! Soon after, the descendants of Shingen Takeda flat out denied that Anri was related to the feudal lord. "There is zero basis for Anri Takeda to call herself the 18th descendant of Shingen Takeda," they told website IT Media via email, going on to call what she did "a profane act." In Japan, families can trace their heritage on their family registry, which is called a "koseki" (戸籍). This is a very old system that was introduced in the 6th century. The vast majority of Japanese were not samurai. They were peasants and didn't have last names until the 19th century. But if people were of higher social standing, like Shingen Takeda, they had last names. His descendants would, then, have carried that name, which could be traced through their koseki or family tree. This is why it would be a big deal to claim to be a blood relative of someone like Shingen Takeda. It would mean that your lineage is not one of a commoner. You are special. Different. This is why the Japanese press made a big deal of Olympic figure skater Nobunari Oda being directly related to Nobunaga Oda. It doesn't mean he's royalty per se, but he has a pedigree. After being called out by Takeda's direct descendants, the model's talent agency said it hadn't confirmed her koseki or family tree. Her agency then told Model Press that Anri said she was a relative on her father's side of the family, but that she had never checked her koseki, and at this stage had zero proof of blood relation. What's more, her real last name is "Suzuki." Internet sleuths on 2ch, Japan's largest forum, dug through the bowels of cyberspace, noting that her blog posts showing food she cooked depicted photos ripped from other blogs. IT Media reports that earlier tonight, Anri's blog was deleted. If she wanted fame, she got it. Typically in English, Shingen Takeda is written Japanese style with his last name first: Takeda Shingen. I've written his name Western style here for clarity.